From Saint James Green walk the short distance to the right towards the solitary tree in the centre of the grassy area. This is Little Green where board 9 is located. Until 1818 a large elm tree stood on this site but on November 5th of that year, a group of mischievous boys set fire "to this piece of vegetable antiquity". 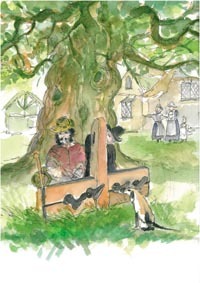 However, sufficient wood was left of the tree to make two substantial chairs for John Bell, Esquire – the lord of the manor. The Great Elm was the place in years gone by where election results were declared and where the town stocks were located. A quote from 1655: - "Richard Barton, otherwise Chapman, was ordered to sitt in the stocks three houres, for that he was convict of prophane swearing at Thirske and did undergoe that punishment at Thirske this session." In 1489, Henry VII demanded heavy taxes to finance a war in France. The northern counties fiercely objected and Henry Percy, the 4th Earl of Northumberland and Lord Lieutenant of Yorkshire, was despatched to collect the money, but there is a local legend that he was dragged from his home in Topcliffe and put to death by a mob near the Great Elm. In the south-east corner of the Little Green there used to be the town’s Pinfold (a pound for stray cattle). 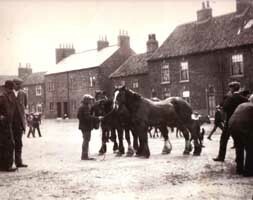 The animals were collected from around the town and a fine was charged to have animals released. 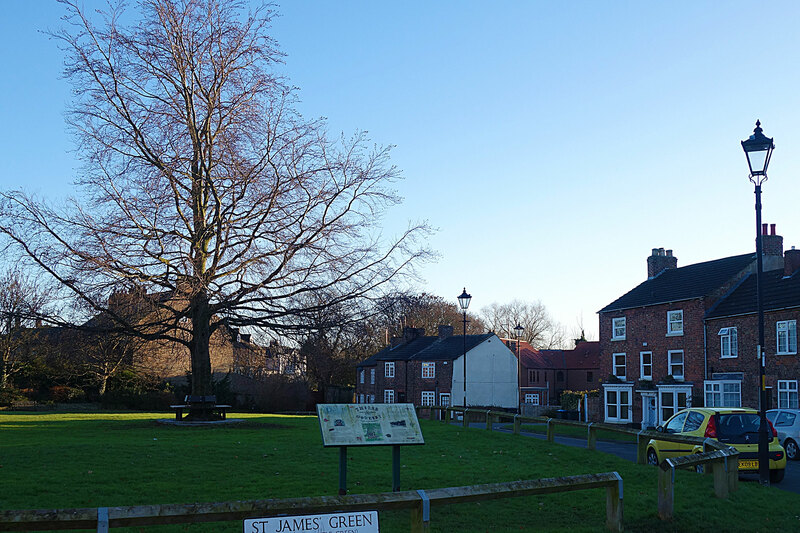 There used to be old cottages to the east of the Little Green but these were pulled down and replaced by the modern houses (some of which were for workers at Austin Reed when that company moved to Thirsk in the 1970s). The photograph, taken about 1906, shows the ‘Dolphin and Anchor’ on the Little Green not long before it closed down. The thatched roof was an unusual survival at a time when buildings were roofed with tiles or slates, but it gives an idea of what most houses on the Green would have looked like in the first half of the nineteenth century. There were at one time six public houses round the Green, serving the needs of drovers and dealers in the days when cattle markets were held here. Only The Lord Nelson survives today.